As if to demonstrate the centre cannot hold, debates around canonical art have shaken down to the East Midlands from a point of origin in New York’s Bronx. 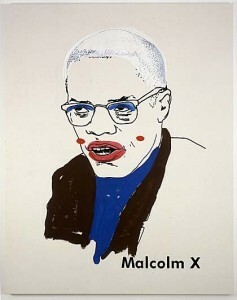 Nottingham Contemporary hosts a curatorial project by US artist Glenn Ligon. Thanks to a creative hang, the regional gallery has set up dialogues between some of the masters of international art along with a range of forgotten voices. Ligon agrees to meet me in the gallery café. He is a patient interviewee who sees the funny side of every other line he utters. He uses the verbal tic ‘you know’ with greater frequency than anyone I have ever met. And with a chunky metal ring and equally bold cardigan buttons, he cuts a dandyish figure who might have got lost on his way to the capital. All the same, he soon tells me he is pleased to be here. “I think Nottingham’s an interesting city,” says the artist. “It has this strong regional museum with adventurous programming. It’s not dumbed down programming for some imagined audience that needs to see certain things. So that was the draw.” Ligon also appreciates the local quota of 60,000 students and was pleased to see a youthful crowd at the opening of his show on April 3rd. That exhibition continues to prove popular, thanks to a mix of big names from the world of abstract expressionism, a strong showing by African American artists, and edgy works that explore sexuality and gender along with race. His comment is a reminder that Encounters and Collisions is a show about the artist’s influences. Yet it is also a show about the universal appeal of art. With some of his choices, such as Kline, Pollock or Beuys and Boetti, Ligon couldn’t have gone far wrong. But the dead white males have been dusted down and put into a vital dialogue with, say, the macabre animations of Kara Walker, or the knowing voyeurism of a group of Zoe Leonard photos. Asked if he sees his many influences as reference points or rivals, the artist responds with one of his amused observations: “I think there’s a bit of both. I think you always want to kill the fathers, or the mothers, so there’s part of that. “But for me it’s looking at an inquiry that was made by a certain artist and seeing where one can go with that, you know, seeing how it intersects with the things one is interested in”. The show will travel to Tate Liverpool and an association with the UK’s biggest art museum franchise has proved handy for securing loans. But a show of this sort remains a feat of organisation. “I’m not a curator, so a lot of heavy lifting around these things, I didn’t have to do,” says Ligon. Nevertheless, the exhibition grew out of a list of names which he supplied. The artist was also able to contact several of his peers directly and several of his letters appear in the gallery handout. It is no surprise to find that Ligon has a way with words, although he doesn’t always choose his own. His most famous works are his text paintings, which employ quotations from literature and stand-up comedy. The starting point for this show was a collection of his essays and interviews called Yourself in the World. And his facility for language has even survived a stint spent as a legal proof reader. “If that didn’t kill off an interest in language nothing would,” he jokes. One of his own works in the show, of which there are several, contains a quote from writer and activist James Baldwin. But the text is buried in a monolithic black painted work with coal dust. Abstract expressionism meets conceptualism, in a space shared with a portrait of Baldwin in oils, by the writer’s friend Beauford Delaney, plus a piece of black and white abstraction by Franz Kline. The show veers between abstraction and figuration throughout and, as Ligon says of this grouping: “I kind of forced those things together”. But, as the artist points out, this needs to filter through. He tells me only three African Americans have had solo shows at the New York gallery, and only “a dozen, maybe two dozen” women. Ligon claims the artworld only “feels” like an inclusive place, “because artists are so bizarre and come from such strange places, but it’s still part of our society and employs the same kind of mechanisms that keep people out of spaces in larger society separate to the art world”. But when asked about the contemporary art landscape today, the New Yorker sees a resurgence of interest in these older forms. “I think there has been a kind of a real interest in, particularly, abstract expressionism. But filtered through technology, filtered through the social ,” he says, before adding: “We have enough distance, I think, from that era to find abstraction vital again, but also do it in a different way, bring different things into it”. Although Ligon remains a fan of ‘Ab Ex’, he has reservations about the monolithic status of the form and its practitioners. “I love the Met in New York, but for years and years and years – probably decades – their selection of modern art never changed. The Pollock was always next to the de Kooning, which was round the corner from the Rothko.” As a Met fan, he still considers this a problem: “You never hear about the dialogues these artists were having with artists who were not the masters, or considered to be the masters”. He adds a rhetorical “You know?” to this observation. Visit this somewhat irreverent show and you can only agree. Glenn Ligon: Encounters and Collisions can be seen at Nottingham Contemporary until 14 June 2015, then at Tate Liverpool between 20 June and 18 October 2015. Interview written for Culture24.